Jim Baugh has been producing national and regional television shows for close to 30 years. Programs include: Award winning Jim Baugh Outdoors TV (220 episodes), Ski East, Classic Fishing. Fishing Virginia and, RV Times. Jim also holds a Bachelor’s Degree in Electronic Music from Virginia Commonwealth University. Jim writes, performs, and engineers all the soundtracks for his television programs. Jim Baugh Outdoors has broadcast on NBC Universal, The Family Channel, The Outdoor Channel, The Sportsman Channel, Fox Sports, America One, and many broadcast affiliates throughout the Mid-Atlantic and South East. Motor boating Magazine, Coastal Angler, Fishing Smart, The Chesapeake Angler, The Sportsman Magazine, Woods and Waters, Colonial Outdoors, Virginia Beach Sports Fishing and Travel Virginia Magazine. Jim also writes and manages many popular on-line blogs including “Jim’s Galley” and the “JBO TV” main blog site. 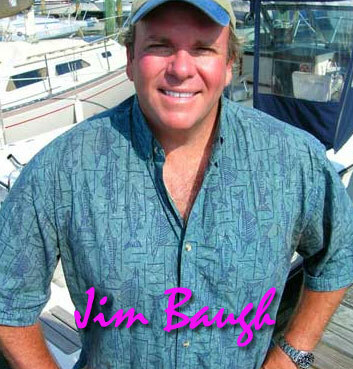 Jim Baugh’s first published book, “HOOKED” was released by Solstice Publishing world wide late June of 2011. The book instantly won critical acclaim earning all five star ratings and was featured book of the month by the publisher during the first month’s release. HOOKED reached best seller status on Amazon in April 2012. Jim finished the sequel to HOOKED, “AFTERMATH” which was published and released by Solstice Publishing late September 2014. The HOOKED screenplay project is based on both books, HOOKED and “AFTERMATH”. Jim’s fourth book, “COOKED” stories behind the recipes will be released during the fall of 2018.